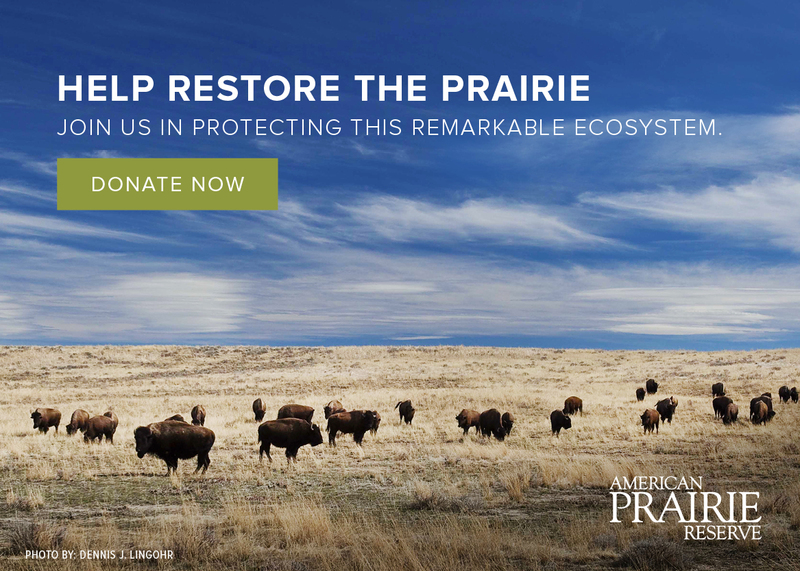 American Prairie Reserve's Wild Passage USA, is an effort to provide safe havens for wildlife dispersing to and from two of North America's most iconic protected areas, the Greater Yellowstone and the Northern Continental Divide Ecosystems. An astounding array of biodiversity were recorded by a variety of visitors from the late 18th through the middle 19th centuries. It was here, in 1846, that famed artist George Catlin called for the “establishment of a nation's park" - 26 years before the creation of Yellowstone. Indian removal and agricultural settlement resulted in the complete eradication of elk, cougar, big horn sheep, bison, and grizzly bears. Game species where reintroduced after World War II, but today exist in numbers far below the regions' biological carrying capacity. The top predators are absent. Wild Passage USA aims to re-connect the vast tracks of public lands along the spine of the Northern Rockies with grasslands of American Prairie Reserve. Science suggests that large protected areas such as Yellowstone National Park is still too small to support viable populations of wide-ranging species. When animal populations are confined to small habitat “islands" they are vulnerable to extinction. The ability for animals to move back and forth through dispersal corridors between protected areas, finding sufficient safe havens as they travel, is imperative to ensuring the health of native wildlife. Wild Passage USA aids in the restoration of an extraordinary wildlife phenomenon that existed for thousands of years prior to European settlement on Montana's Northern Great Plains. These temperate grasslands were home to the largest number and variety of wildlife species of any region in the lower forty-eight states. The first exciting phase of wildlife movement is underway. Wild Sky is advancing these conservation efforts by recruiting ranches within wildlife dispersal corridors. Over time, Wild Sky ranches increase the social carrying capacity for wildlife - improving the ability of bears, elk, and pronghorn to move across the landscape. New generations of Wild Sky ranchers grow up with a different conception of what it means to live and work in a land characterized by biodiversity abundance. In time, grizzly bears, wolves and swift fox - the last three animals still not present on the grasslands - will return and thrive on American Prairie Reserve. The second phase of success will be indicated by species moving back and forth between all three eco-systems.